Our involvement with FIRST started with one team in 2015. Since then, our FIRST head coach, Beth Mai, has led 18 teams through the FIRST Lego League Junior season. We love FLL because it fits so well with the goals and values of Stanton. Our children love it because they have fun, learn new and interesting things, make their own decisions about their work and create unique projects that they are proud to share. Since the 2015-2016 season, our teams have shared their work locally, provincially, and internationally. This year, we were proud that one of our FLL Jr teams, the Masterbuilders, were selected to share their project at the FIRST World Festival in Detroit along with 54 other teams from around the world. There, they received an award recognizing their outstanding research, which complements their local award for their model. This marks the second time that one of our teams has been chosen to participate in the international festival. Another of our FLL Jr teams, the Lego Wavemasters, were selected to attend the FLL Jr Provincial Expo in Brampton, Ontario this spring. We were so proud of their excellent project and presentation to reviewers and were thrilled to see them take home the award for Outstanding Teamwork! 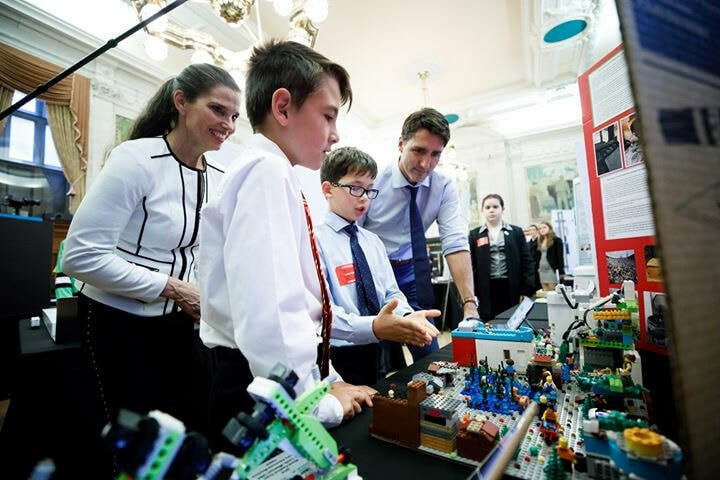 Members of our Masterbuilders team present to Prime Minister Justin Trudeau and Kirsty Duncan (Minister of Science) at the Prime Minister's Science Fair in Ottawa (2018). ​Click below to see projects from the 2017-2018 season.